This is a comfortable, light, smaller frame, and I like the flex hinges on the temples for a secure and comfortable fit. With a light complexion, finer features, and grey hair, I am often looking for alternatives to the large, chunky, angular, black (or dark/bold) frames that seem to dominate current eyeglass frame selections, desiring and looking for something to complement rather than to dominate. I like this frame because it fits this bill well. I was unsure about the bridge size (16) being too small (I usually wear something like 19 or 20) but it still seems to fit well. 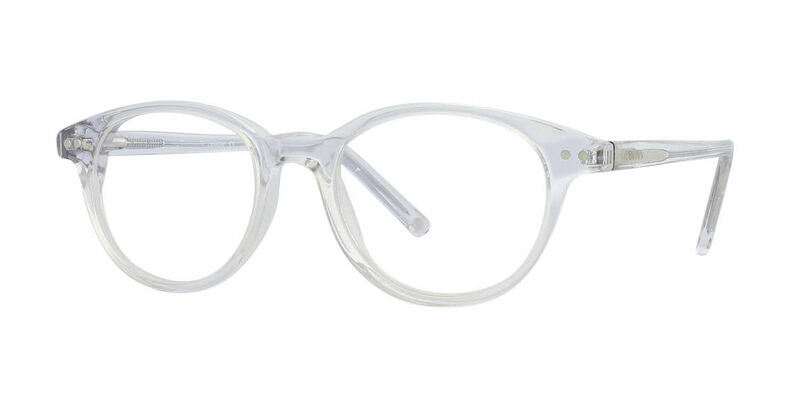 This is the first time that I have had clear/crystal frames, and even though I have had lighter color frames before, this is definitely a different look. The only negative for me with this frame - and it is very minor - is that with a light source at the right angle above me, I can sometimes see some reflection of the light from the frame itself. I was more aware of this when I started wearing the frame, but don't notice it much after a couple of weeks. It's not a problem, just that I sometimes notice it. Also, I had a good experience with the Frames Direct customer service. The first frame that I received had a small but noticeable blemish right below one of the eyes. Frames Direct handled the exchange easily with no problems.